Since 1980, ElastoTech SouthWest, Inc in Crockett, TX has been providing high-quality and cost-competitive custom molded and standard rubber products. 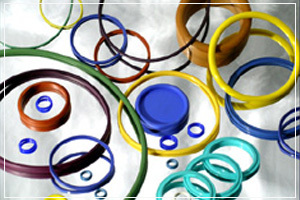 Whether you are looking for O-rings, gaskets, or custom molded shapes, you can be sure we use only quality-tested materials designed for your specific application and thoroughly inspected to meet your needs. Our 22,554 square foot facility houses the presses, finishing equipment, and storage system that helps us to serve you so well. At ElastoTech SouthWest, Inc, we deliver the highest quality products because we know you expect nothing less than the best. Many of our machines have been designed, rebuilt, or augmented by our equipment manufacturing subsidiary, ElastoTechnologies. Listed below are some of the equipment used to produce our outstanding custom molded and standard rubber products. 1 Sand Blaster, 12 Cu. Ft.
Do you need custom molded rubber compounds for your new or existing product? Make us your rubber fabrication business partner. Take advantage of our outstanding craftsmanship and quality inspection process. For more information about the rubber materials we manufacture, give us a call or send an email.